While Matthew Kilduff is no longer president of Student Senate, he is not slacking off either as the current chair of External Affairs. Though Kilduff’s role in the Senate is certainly less demanding than his previous office, the University of Rhode Island senior wanted to be sure he was still helping students, even though he was moving to a house in Narragansett for his final year. Kilduff joined senate in his freshman year as he thought hands-on experience with laws would aid him with his then-dream of becoming a lawyer. While he has changed his plans since, the senator still feels it has been a very fulfilling job. “It’s just a great way to give back to the school,” he said. Kilduff also likes how dynamic the job makes his life. Kilduff’s term as president was a stressful one, primarily due to the debate over arming campus police, but he certainly does not regret holding the role. Though he was also excited about the changes the Senate made to how student organizations are categorized, Kilduff said his greatest achievement as president was being able to inspire his chairs to do great things. 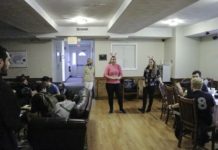 In addition to his role as external affairs chair, Kilduff is also involved in Greek life. He is a member of Zeta Beta Tau and is the secretary of URI’s Interfraternity Council. He has also been a student orientation leader for the last three years. While his plans for the future are not set in stone, Kilduff is thinking of working at a college. Though the degree in economics he is working toward will not necessarily be specific to his future career, Kilduff is sure the knowledge he has gained will be useful. Overall, Kilduff said what he loves most about URI are the opportunities it provides students.